It has been almost 40 years since the Wiener Staatsoper last mounted Berlioz’s Les Troyens. In the interim some norms have changed, especially when it comes to casting roles such as Cassandre and Didon. It is hard to imagine the Trojan seers of the past, whose allure rested generally in their voluptuous voices, stalking about the stage like a sleek black leopard as did Anna Caterina Antonacci, or those earlier Carthaginian queens emanating the languorous sensuality of Joyce DiDonato entwined with the Enée of Brandon Jovanovich atop a mound of cushions. Both Antonacci and DiDonato were exciting vocally but hardly overwhelming. Dramatically, however, they were sensational. Antonacci fearlessly hurled Cassandre’s predictions of doom like javelins at the celebrating Trojans, but there was little velvet to the voice. Adam Plachetka as Chorèbe tried to calm her fears with some of the loveliest, warmest legato sounds imaginable from a warrior. The Mozart roles in which I have previously heard him did not reveal the full power and beauty of his voice. Jovanovich’s Enée was yet another of this remarkable tenor’s memorable characterizations. In Troy his high notes sounded but did not ring. Once in Carthage as a supplicant and lover, the top of his range was instantly connected to the rich middle of his fascinating voice. That he came off as a callous cad at the end had as much to do with Didon’s unbridled rage at his slipping out of port without a final good-bye as it did with him blindly following his destiny. DiDonato was carefree and breezy in Didon’s opening scenes, singing with the feathery lightness and amazing agility for which she is renowned. As with Jovanovich’s Enée, passion transformed her singing. Her voice steadily gained in presence and intensity, although there was little bloom to it as she reached for the climaxes of Berlioz’s arching phrases. The final scene was a revelation as Didon raged impotently at being abandoned by Enée; DiDonato rose to astounding vocal and dramatic heights that left the audience agasp. Berlioz did not stop with solos for the principals but spread them evenly through the rest of the cast. Szilvia Vörös as Anna, Didon’s sister, displayed an uncommonly dark, alluring mezzo-soprano, undoubtedly the most voluptuous sound heard from the women of the cast. Narbal, Didon’s trusted minister, was the robust, clarion-voiced bass Jongmin Park, and her court poet, Iopas, was Paolo Fanale, a young lyric tenor with a silvery voice. Peter Kellner as Enée’s compatriot was a vivid presence on stage with a particularly appealing bass voice. Benjamin Bruns as Hylas sang longingly and beautifully of the homeland that he will never again see. His refreshingly light tenor creating a perfect moment of repose amidst all the frenzy and passion. The duet of the two Trojan soldiers sung by Marcus Pelz and Ferdinand Pfeiffer provided the comic relief; they were quite content enjoying the comforts of Carthage, with no desire to shove off to face more sea voyages and battles. In a league of their own in terms of brilliance and excitement were the electrifying performances of the chorus, orchestra and dancers. The female dancers were lithe and graceful as they moved about the stage, while their male counterparts took flight performing backflips, somersaults and handstands that repeatedly sent electrical charges through the house. The chorus wasn’t called upon to exert itself physically, but vocally they were every bit as impressive. The orchestra was perhaps even more splendid. The brilliant playing of the offstage trumpets and the burnished sound of the horns were thrilling, but most imposing of all were the eight contrabasses with their backs against the apron of the stage playing directly to the audience in Act III. It is not often that one encounters such aural and physical sensations in an opera house. Conductor Alain Altinoglu was in total command of the massive forces throughout the more than five-hour performance. He crafted transparent, scintillating accompaniments for the singers, while unleashing torrents of sound when balance was less of a concern. It was a bravura performance. 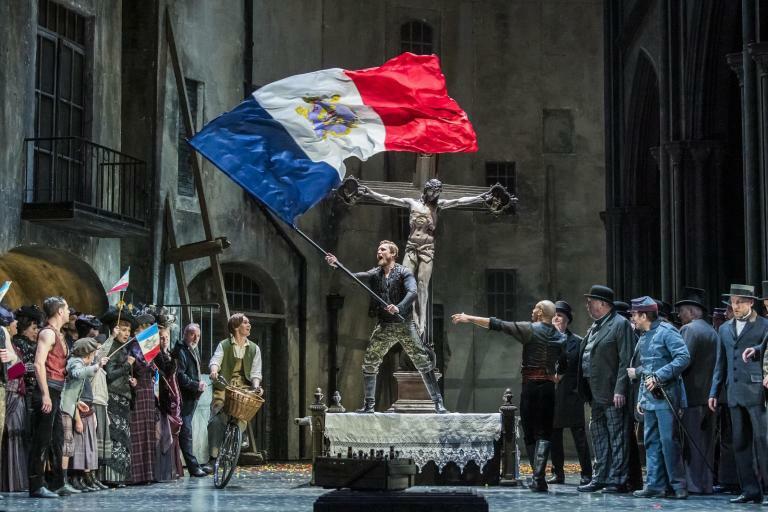 David McVicar updated the action to the mid-nineteenth century, mostly discernible in the costumes (except for those of Cassandra and Didon which were more like satiny negligees) and the debris of war that littered the stage. It was attractive enough, but any insights provided by setting it in more recent times passed me by. The barrel-like set served as the walls of both Troy and Carthage, opening to reveal the horse made from the flotsam and jetsam of the decades-long conflict. Its real benefit was in providing an excellent platform to place the chorus who, like the eight double basses, could just plant themselves and sing. For the Carthaginian scenes, a miniature reproduction of the city was manipulated in various ways to telegraph Didon’s transition from happy monarch to a forsaken, vengeful, suicidal woman. Mercury appeared as a giant black-winged creature and, as Didon hurled her final curses, Hannibal, constructed from the same metal elements as the Grecian horse, rose and towered over the burning pyre.